Reflejos Flamencos has performed Spanish music and dance for over 20 years with many of Spain’s top artists. Guitarist Johnny Beard has been playing for four decades. He studied with well known musicians such as René Heredia, Roberto Castellón, Pedro Cuadra, and Chuscales, and he has performed at many flamenco festivals. He has entertained countless children with lecture demonstrations in schools around the state through the Arts and Humanities Council of Tulsa’s Artists in the Schools program. An expert craftsman, he also builds flamenco guitars and cajons. Johnny’s daughter Lexi Allen began her formal dance training at age five and soon began performing with her father. Lexi was chosen by internationally acclaimed flamenco dancer Maria Benitez to be a soloist at many of her annual flamenco presentations. 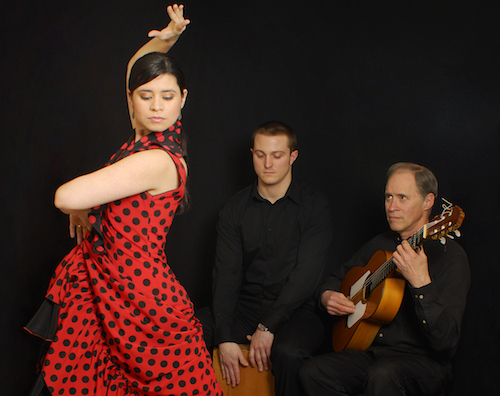 Lexi has studied and performed with many of Spain’s leading flamenco artists. After returning from studying in Seville, Lexi was invited to teach flamenco dance with the Maria Benitez Institute for Spanish Arts in Santa Fe, NM for the 2005 Flamenco Workshop. She has served as guest choreographer and professor of dance at Oral Roberts University and currently teaches flamenco dance with FlamencoTULSA at the South Tulsa Dance Co. and the Liggett Studio. Reflejos Flamencos now includes her husband, Dylan Allen, on cajon. In 2010 the trio formed FlamencoTULSA, which provides classes, educational opportunities, performances, and other community events.